Watts 2 port Stainless Steel Manifold, Fill and Vents connections, Flow and Return Valves, Underfloor Heating Pump and Water Temperature controller, select the correct pipe connection from the drop down. 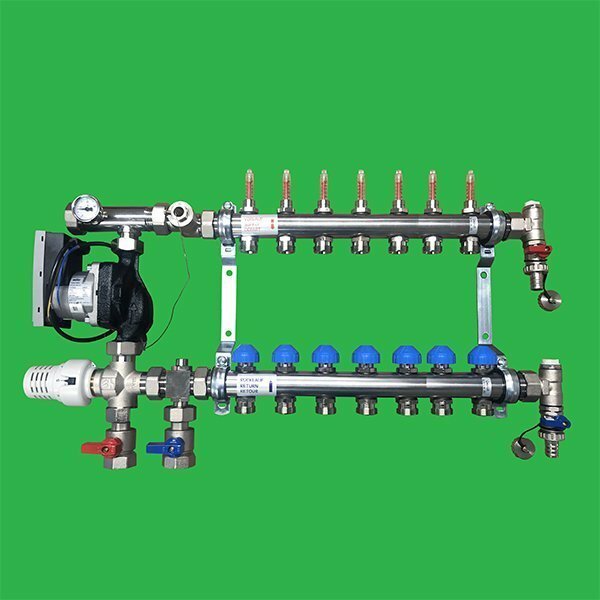 Watts 3 port Stainless Steel Manifold, Fill and Vents connections, Flow and Return Valves, Underfloor Heating Pump and Water Temperature controller, select the correct pipe connection from the drop down. The underfloor heating manifold with a Energy Saving A rated Underfloor Heating Pump and Reliance water temperature blending control unit, which offers a neat assembly with no other pipework other than connecting the flow and return pipe work to the 3/4" BSP thread using compression fittings N.B.The picture illustrated is generic. 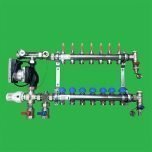 This UFH manifold pack comprises of - 2 x 1″ Manifold barrels with 12 port / way or outlets. 1 x Red 1/4 Turn Flow Ball valve with easy seal joints. 1 x Blue 1/4 Turn Flow Ball valve with easy seal joints. 2 x Tee piece manifold connectors with easy seal joints. 12 x Adjustable Flow Meters. 2 x Fill & Drain connections. 2 x Wall brackets ready assembled to the manifold. 1 x Grundfos A rated UPM3 Pump or Wilo Yonus A rated Underfloor Heating Pump (as per your selection). 1 x Reliance Thermomix Blending - Mixing Valve. N.B. 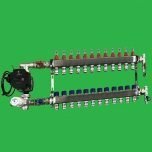 These UFH manifolds are identical to those supplied by John Guest Speed Fit (except for the push fitting) but look at the money you can Save against Speedfit. Pipe Coupling Nut Options Please see the UFH Manifold Pipe Coupling Nuts for sizes available sold separately from the manifold, sizes range from 12mm to 20mm pipe connections. The correct quantity of pipe coupling nuts on selected size will be automatically placed in your shopping basket. This water underfloor heating spreader plate pack comprises of 40 Aluminium UFH Double Spreader Plates 1000 x 390 mm to suit pipe diameters from 15 - 17 mm, each aluminium spreader plate has performed groves for ufh pipes at 200 mm centres. These diffusion underfloor heater spreader plates has an omega shape grove to hold the underfloor pipe secure unlike a straight U channel ufh spreader plates. This water underfloor heating aluminium spreader plate pack of 20 aluminium plates will cover a floor area of 20 m² (Twenty Metre Square) 1000mm x 390mm double ufh spreader plate is often known as aluminium diffusion plates for suitable for 15mm 16mm and 17mm pipes. The UFH spreader plates are suitable for suspended floor systems and are fitted on top of floor joists or battens at the standard 400mm centres (should the joist spaces vary this can be usually overcome on site). The double groove ufh spreader plates have preformed channels with pipe centres of 200 mm, the spreader plate can be nailed, screwed or stapled onto the top of the floor joist. The metal spreader plates are one of the most effective ways by giving a homogeneous heat transfer to the underside of wooden floor - floor boards. With aluminium like most metals it makes an excellent heat conductor and transfers / diffusing the heat efficiently to the underside of the floor board. The aluminium diffusion underfloor heating spreader plates will give the UFH heat output of 77 watts per m2 at room temperature 20 deg. Celsius with a floor temperature of 27 deg Celsius. We recommend that the ufh spreader plate sits tightly beneath the floorboards giving direct contact which will offer the maximum heat transfer from your underfloor heating system. Insulation should be fitted directly beneath the spreader plate. SALE ITEMS CAN BE WITHDRAWN AT ANYTIME AND ARE SUBJECT TO AVAILABILITY.